Who’d ever want a cup of Death Wish Coffee? 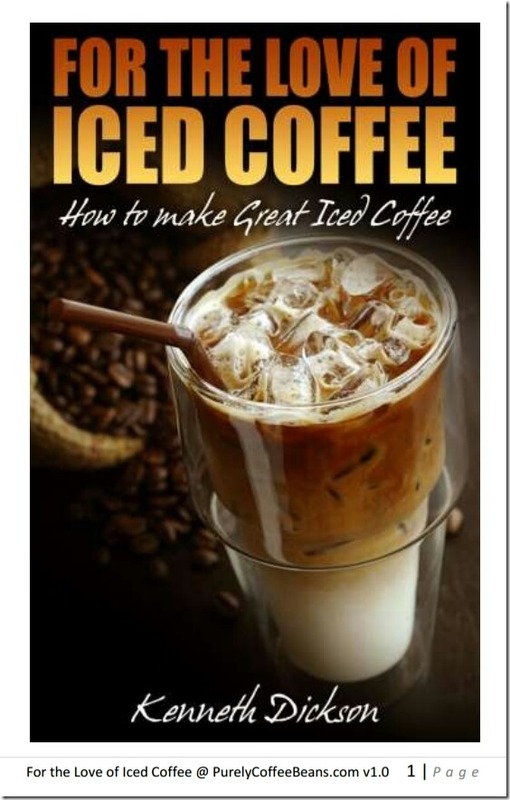 I was running through the clicks to my Amazon store to find out what coffee beans readers were actually buying, when I came across this rather oddly named blend. Turns out that a reader ordered Death Wish Coffee! Death Wish Coffee, The World’s Strongest Ground Coffee Beans, Fair Trade and Organic! I’d never heard it of it… the first thought that crossed my mind: will it kill me? I’m pretty sure I don’t want to die. However, the reviews on Amazon suggested that imbibing the world’s strongest coffee did not kill the reviewers, so it wouldn’t likely kill me either. The story’s kinda cute, too. 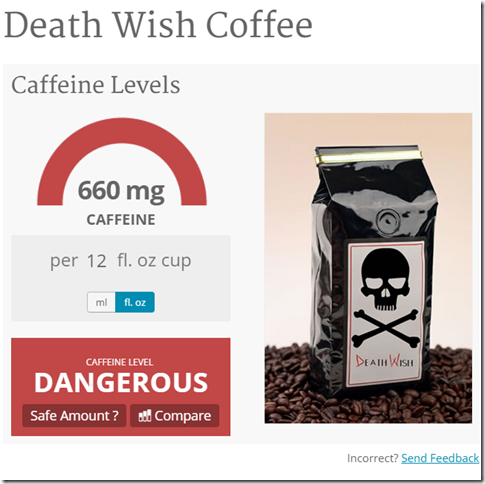 So what exactly is Death Wish Coffee? Have you tried it? What’s it like? What other coffees are similar? Do they boost the caffeine with the addition of robusta beans? How do you get “double the caffeine” from arabica beans? So I asked someone who’d tried it to write a review. This is their review! 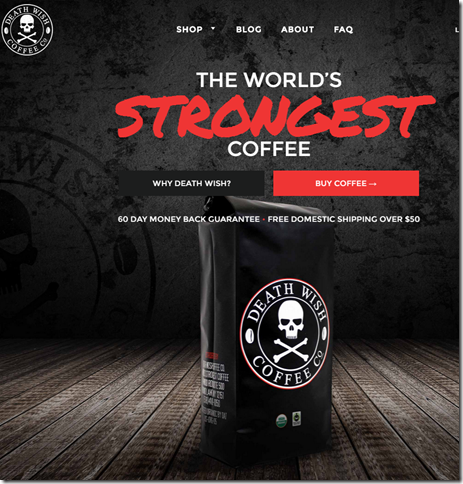 Death Wish Coffee claims to be the “world’s strongest coffee”. It is sold in a 1 pound bag, 5 pound bag and in single serve cups. I tried the variety that is used in coffee makers so I could adjust the mixture according to how I make my usual brew. I take my coffee black so I can really taste the coffee and not the cream or the sugar so I did the same with it. After tasting Death Wish Coffee, I must admit that it is indeed a rather strong blend. I don’t know if this is because I take my coffee black without cream or sugar or if it really is the strongest in the world. I do know that it is the strongest that I have had for a very long time! It is definitely a dark roast coffee which is why it is rather strong but I did not expect it to have a smooth taste. I was expecting a burnt taste which is what I usually get from dark roast beans. I also got quite a kick out of it which I really was not prepared for. This “kick” can be described as a pleasant surprise because I was really expecting coffee that can be used to power vehicles (in other words, coffee that tasted so bad and strong that it would keep you awake just trying to get the bad taste out of your mouth!). Instead, I got a great tasting brew that did not go south even when it got cold. I love the packaging! It really displays what the makers want their customers to expect from it. For those who are used to strong coffee this will not be a disappointment. It is really strong but very delicious as well. Those who prefer their coffee in the designer range might want to skip it because there is no designer in the house from which it is made. The strength of the coffee might give you an upset stomach so be careful with that. It did keep me alert and active for most of the day with just two cups so those who are easily affected by caffeine might want to keep their intake at the minimum. Overall, it is a strong brew with a great taste. A bit on the pricey side but still affordable enough for those who like the taste. I didn’t try the single serve cups but I assume that these might have a milder taste compared to custom brewed. How much caffeine? Could it kill you? Is their claim verified? Well, turns out that someone already has done a little footwork on this issue. You can check out the source yourself to find out just how ‘dangerous’ it is. The only point that I should add: caffeine can kill in a strong enough form and amount. Called “caffeine toxicity”, an amount of approx 5-10 grams could easily be lethal. However, at normal strength coffee level, you’d be more likely to die from “water toxicity” (ie. consuming too much water) first. In short, don’t drink too much of this coffee or any form of caffeine. If you do, and you feel unwell, consult your physician immediately or go to the ER if it’s an emergency. And if you have any kind of intolerance for high caffeine drinks of any kind, or you have been warned by your doctor, go decaf instead. As a personal note, I do enjoy coffee for the buzz effect that can be found, but it’s the aromatic smells & flavors that make it a beverage that I love. Not the caffeine.